"Comfort and value in a tranquil setting "
This freshly painted one bedroom suite is broadloomed and has a balcony. For just a small, yearly membership fee, you can enjoy full use of our year round fitness and recreational facilities which feature saunas, card rooms and an indoor pool. At Carabob Court, we offer you comfort and economy in an attractive setting, with large, broadloomed suites. 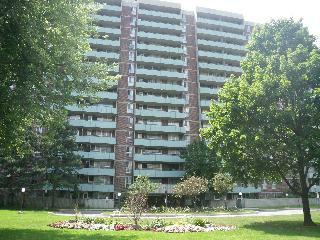 Steps to schools, Agincourt Library, shopping, banks, medical offices, and countless other amenities. TTC is at your door including a 24 hour bus route, or a short walk to the GO Station, as well as easy highway access. For a small, yearly membership fee, you can enjoy full use of our year round fitness and recreational facilities at 50 Carabob Court, which feature saunas, card rooms and an indoor pool.